If you've ever watched spiders trap their prey in their sticky webs, you've probably wondered: "Why don't spiders stick to their own webs?" 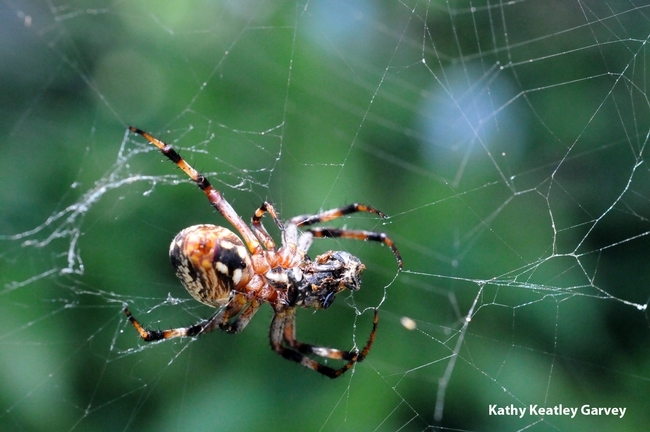 We've watched countless spiders trap honey bees, syrphid flies and other hapless critters in their webs. The spiders scamper up and down the webs as their victims furiously try to escape. 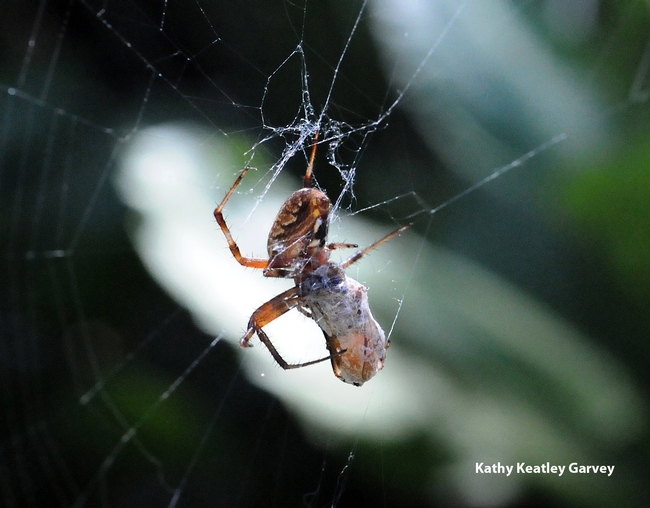 Now researchers at the Smithsonian Tropical Research Institute, headquartered in Panama City, and the University of Costa Rica have discovered why spiders don't stick to their webs. The spiders' legs are "protected by a covering of branching hairs and by a non-stick chemical coating," the scientists announced in the journal Naturwissenschaften (The Science of Nature) and on EurekAlert. Wrote Beth King of the Smithsonian Tropical Research Institute: "They also observed that spiders carefully move their legs in ways that minimize adhesive forces as they push against their sticky silk lines hundreds to thousands of times during the construction of each orb." Furthermore, the scientists recorded the webweaving behavior on video. The camera showed that "Individual droplets of sticky glue slide along the leg's bristly hair." So now one of the most common questions (next to "Why is the sky blue?" and "Why is the grass green") has been answered. Check out the videos on the EurekAlert website.